Cash-Strapped State Courts Remedy: A Litigation Excise Tax? As illuminated in an April 28 article in Bloomberg Business Week, budget cuts in the states have had a staggering impact on state courts. The article notes the creation of a task force including the American Bar Association as well as prominent plaintiffs’ lawyers, defense attorneys, and corporate counsels which will compile data and lobby for more funding. Lawyers feed off of a very willing host – the legal system – producing costs for that system but giving very little back to it in return. State and federal governments certainly knows how to extract revenue through excise taxes from businesses which policy makers feel benefit too handsomely from their products. For instance, a little-known section of the federal health care reform law (The Affordable Care Act), requires medical product companies which sell their treatments to the Medicare program to pay an excise tax (more on that here). The tax applies to prescription medication companies, not generic drug producers. 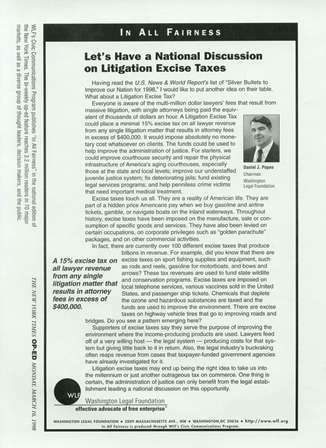 Excise taxes are also used to discourage consumption of “disfavored” products, such as alcohol and tobacco. A Litigation Excise Tax not only would help fund the state courts, but it might also achieve the added benefit of discouraging meritless litigation which occupies valuable judicial resources and often benefits no one but the attorneys. Maybe we would have less litigation like the recently settled class action lawsuit against Google for alleged harms caused by its Google Buzz service. As we’ve previously noted at The Legal Pulse, that suit led to zero restitution for the class members, and the lawyers are asking for $2.55 million in fees. Such a levy might be the right idea for states looking for funds to keep their courts open, or it might be just another outrageous tax on commerce. But isn’t something that might improve everyone’s access to justice worth considering?